UPUMS invited applications for recruitment to 32 Faculty posts. The candidates eligible for the post can apply through prescribed format on or before 15 December 2016. 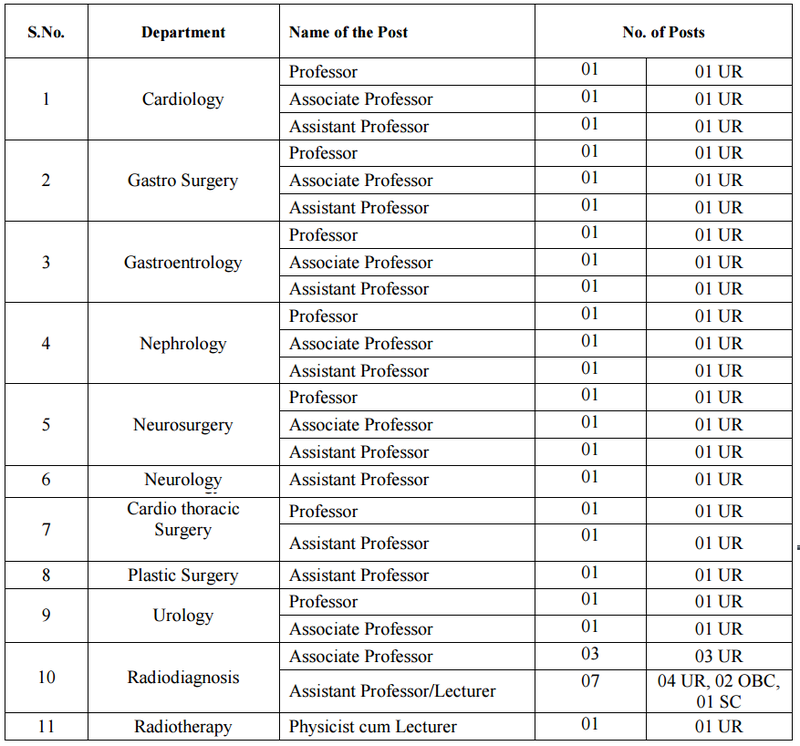 Uttar Pradesh University of Medical Sciences (UPUMS) Job Notification: UPUMS invited applications for recruitment to 32 Faculty posts. The candidates eligible for the post can apply through prescribed format on or before 15 December 2016. Educational Qualification for Professor Post: For Professor, 12 years (As Associate Professor in the subject for three years with 04 research publications as a First/Second Author in indexed/national journals as per MCI), for Associate Professor, 04 years (As Assistant Professor in concern subject for three years with 02 research publications as a First/Second Author in indexed/national journals as per MCI) and for Assistant Professor, 01 year of teaching experience after obtaining the degree of DM/MCh. (2 Years duration ) in the concerned specialty at a recognized teaching Institution. OR For Professor, 11 year (As Associate Professor in the subject for three years with 04 research publications as a First/Second Author in indexed/national journals as per MCI), for Associate Professor, 03 years (As Assistant Professor in concerned subject for three years with 02 research publications as a First/Second Author in indexed/national journals as per MCI), for Assistant Professor, person possessing D.M/MCh. Degree (3 years duration) in the respective specialty at a recognized teaching Institution. Educational Qualification for Associate Professor Post: (i) As Assistant Professor in the concerned subject for four years in a recognized medical college/ Institute. (After MD/MS 6 years teaching experience from recognized medical college/ Institute.) (ii) Minimum of two Research publications as a First/Second Author in index/national journals during the tenure of the Assistant Professor. Educational Qualification for Assistant Professor Post: (i) Recognized postgraduate (MD/MS.) qualification in the subject. (ii) Three years post PG. teaching experience from recognized medical college/Institute. Educational Qualification for Lecturer Post: - Recognized postgraduate (MD/MS.) qualification in the subject. Interested and eligible candidates can apply either online or offline. ON LINE – Visit to University website- www.upums.ac.in and apply online with application of fee Rs. 1000/- (for Unreserved/OBC Category) and Rs. 500/- (for SC/ST Category). OFF LINE- Download application form from University website and filled form along with relevant documents and Demand Draft of Rs. 1000/- (for Unreserved/OBC Category) and Rs. 500/- (for SC/ST Category) in the favour of “Finance Officer, UPUMS, Payable at Saifai and should be send by Speed/Registered post to the University address.